Starting college obviously triggers plenty of life changes — moving away from home, making new friends, taking harder classes, sharing a bathroom with strangers and dropping large amounts of money on books. These are all things most students are warned about before they officially make the transition into college. However, many students don’t look too deeply into their food options before coming to school — which would explain the constant long lines at Market Central in the early weeks of classes. Thankfully, our staff is here to shed light on dining options on campus! “Eat mor chikin,” they say. Well, don’t mind if I do. Chick-fil-A in the Cathedral Cafe is convenient and delicious. Not only is it easy to make a stop in the basement of Cathy after class, but it’s even easier to pick up food without having to wait in a long line (well, most of the time). This campus Chick-fil-A doesn’t offer the entire menu, just the essentials — chicken sandwiches, salads, chicken nuggets, chicken strips and, of course, waffle fries. Yes, the classic waffle fries made from potatoes straight from the state of Washington. Sure, the grilled chicken at Market is a hit, but why wait 20 minutes for something that is usually dry and overcooked? Why not have a variety of forms of beautifully seasoned chicken? And let’s not forget about the multiple sauces, like the Chick-fil-A sauce that pairs with chicken and fries alike! There’s also salad options for vegetarians and deliciously sweet lemonade for all. Honestly, the worst part of Chick-fil-A is that it’s only open five days a week. As exciting as it is to come visit Pitt on your Admitted Student Day and get a free meal at Market Central’s all-you-can-eat buffet, the novelty of Market will eventually wear off. I lived in Holland Hall my freshman year, which meant Market was close by. Every day, multiple times a day, I would go there to eat. Needless to say, I got pretty sick of the chicken patties, stir fry with unusually-dry chicken and pasta that I had to wait about 30 minutes for. The windowless dining hall started to feel like a dungeon of weird-smelling food and I would have rather eaten bagels in my dorm all day than returned to that place. But then one day, everything changed. A friend of mine who lived in Sutherland Hall introduced me to the dining hall in her building, The Perch. Another dining hall on campus! Who knew? This one offered pancakes for dinner on certain days of the week, a big salad bar with craisins — my personal favorite part of a salad — tortilla chips with hummus and salsa, and an excellent view. The huge windows of The Perch overlook all of Oakland — which is quite a nice change from the dungeon dining hall in the basement of the Litchfield Towers. If I’m ever craving bagels and smoothies, Einstein Bros. is the way to go. Einstein’s is a hit with both student and faculty alike, and is conveniently located in both Posvar and Benedum Halls — on the second floor and basement levels, respectively. More often than I can count, I would run over to Posvar after morning recitations to try and beat the early rush of patrons in need of breakfast. Einstein’s boasts a sizable menu of not only a wide variety of freshly-baked bagels, shmears and Caribou Coffee, but also salads, fruit smoothies, cookies, muffins, pastries, and all manner of breakfast and lunch sandwiches. They always add new items to the menu, so it’s fun to see what different things there are to try. Einstein’s is also one of the many on-campus dining locations that utilize the app Tapingo, so you can order ahead and have your food ready to pick up for when you get there. This may be the key way to avoid the 10 a.m. breakfast rush hour, or you might be fine waiting in line normally as the service is usually quick and efficient. In any case, no matter what the occasion, Einstein’s is a definite must. OK, OK, I know what everyone’s thinking. Market? Really? The lines can get so long! And that’s like picking Harry Potter as your favorite character, it’s so obvious. But the dining hall in Litchfield Towers was always somewhere I looked forward to visiting after a tough class or when I needed to hunker down in a corner table somewhere to study and stress-eat for a few hours. Armed with my standard accompaniments — a plate of baby spinach and a glass of chocolate milk — I would dig in to one of the dozens of dishes the establishment offers. 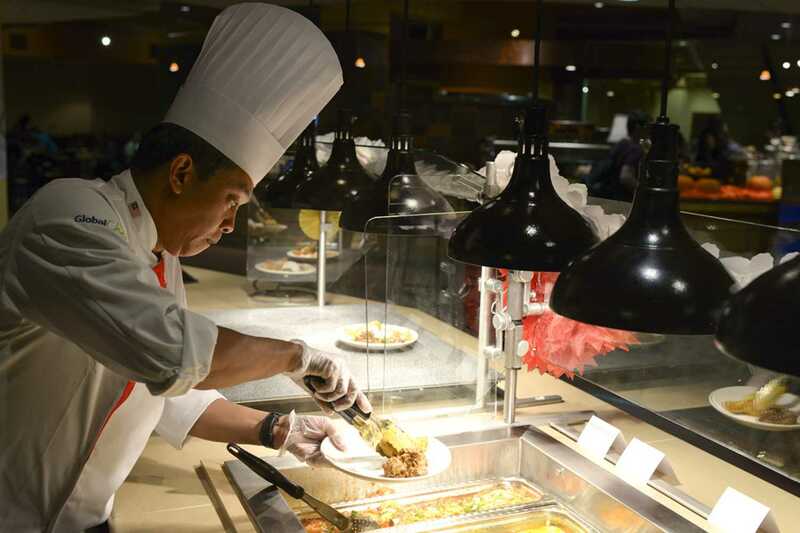 Back when I still had a meal plan, I didn’t mind waiting for many of Market Central’s tasty routine offerings, like the grilled chicken at the Flying Star Diner or a pasta bowl made at Bella Trattoria’s pasta bar. Almost all of these places present a different plate-of-the-day alongside some usual fare. I could always fall back on a year-round option if I decided I didn’t like any of the new offerings. I also relished in the dining hall’s familiar surprises. I enjoyed rolling up to Magellan’s and seeing if they were offering nachos, soft shells or both at the weekly lunchtime Taco Tuesdays. I also looked forward to the fancy Double Swipe Nights on Fridays, when Magellan’s would offer some hearty gourmet meal, like shrimp fettuccine or a wing bar. With its spacious yet cozy vibe and wide variety of food, the place is a Pitt institution — I mean, would we really have wanted to hang around Hogwarts without Harry Potter?